In July 2003 I composed and recorded a piece of music called ‘Dabbler’s Hand’. An amalgamation of Piano and Synths descending violently on top of each other in confined space, struggling together on a bass line holding the pocket, with percussive late night intensity, in their attempt to exist and be heard. The music was the manifestation of my hypersensitivity and Synaesthesia (coloured hearing). During that period of time between my early teenage years and mid 20’s, I seemed to feel everything deeply. I wanted to absorb everything emotionally, to feel what was felt by others. Not so much the pain, but all the yearning, longing and desire of youth and maturity. Some years later I added the music to footage I recorded of the high streets of Central London, from the vantage point of the top deck of a bus. I kept the camera rooted in one spot like a picture frame with masses of faceless people moving in and out of it. The footage is hazy. Every face being passed by the camera symbolises past, present, future, loves lost, forgotten, remembered, drifting in and out of your life or your memory. Those faceless masses also symbolise Time and the idea that we are constantly in motion. Time doesn’t stand still. Infact, Time is one of the two central characters in the film. As the film nears its end the music stops. Eventually an ‘old’ man comes into the frame of view, with the focus on him. He is not faceless like the moving masses who represent ‘Time’. He walks forwards slowly, as people breeze by him. Then he stops and pauses for a lingering, metaphorical moment. The ‘old’ man is a representation of all our humanity because he has been young and is now advanced in age (Youth and Maturity), knowing all that comes with both distinctions. In that brief moment with Time (the helter skelter faceless masses) passing him by, he represents all the yearning of young and old, the desire to exist, to have our face remembered. He is the embodiment of our desire to withstand the test of Time, and our attempt to transcend it, as we cannot halt its forceful hands. In that moment he reminds us to pause and consider our lives and loved ones, and even strangers that pass us by. As insignificant as we may seem, we matter. People matter. Every life matters. In that brief moment of stillness, he cuts through the drift of Time. And then he walks out of the frame of the camera. That’s where my camera battery (and the film) ended, as if composed and directed with foresight. 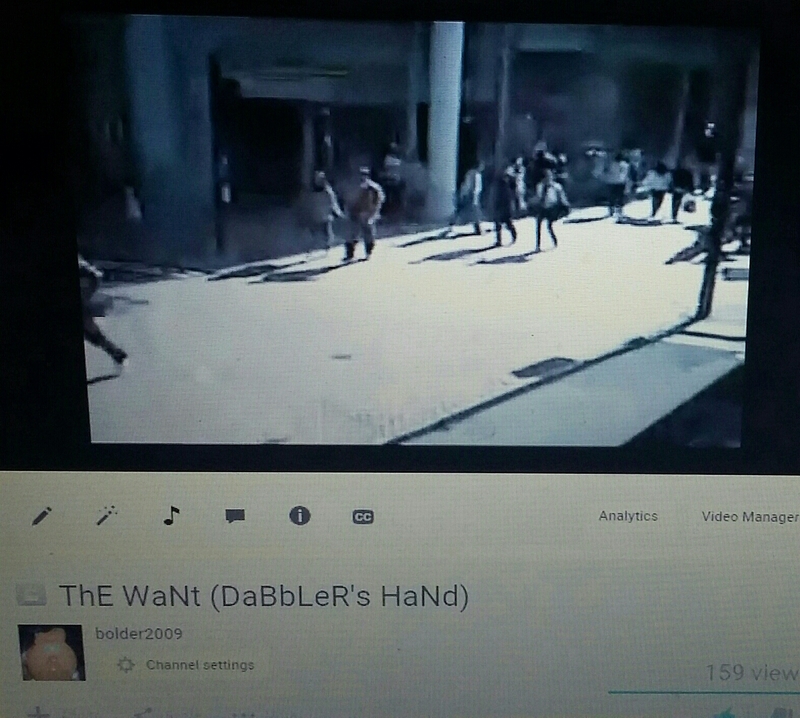 I called this film, ‘The Want (Dabbler’s Hand)’. In some ways we are all dabblers. Amateurs in the game of life, taking a chance at something or someone, and hoping that we’ll survive the roller coaster adventure and find some resolution if we should fall. Again and again.